I have always had a fascination with messenger bags, but have never found one that fit my needs. I love the roominess of messenger bags but I hate the lack of compartment separation and a secure location for my laptop or iPad. The Lunar Mirror Messenger from Altego has a solution for my problem. It has the following listed device compatibility size: 15.25″ x 11.25″ x 1.75″, this is for use with the protected pocket specifically designed for laptops. As you can see from the picture, the front flap of the Lunar Mirror Messenger bag has a small zippered pocket, two hold down straps that secure with the Fidlock magnetic snap buckles, the Altego logo and a nice sized reflective strip for low light visibility. The zippered pocket on the front is a little odd because you will have to slide items up into the pocket and not down into it. It may not be practical, but it is a zippered pocket. This is not the first Altego bag that I have reviewed, one of the unique things I liked about my previous review was the Fidlock magnetic snap buckles. Unlike your usual snap buckles, the Fidlock system use magnets to help keep the buckle secure. You would think that it would be easy to separate or pull apart, but it isn’t. There is a trick to getting the buckle to open, which is sliding them apart instead of trying to pull them apart. 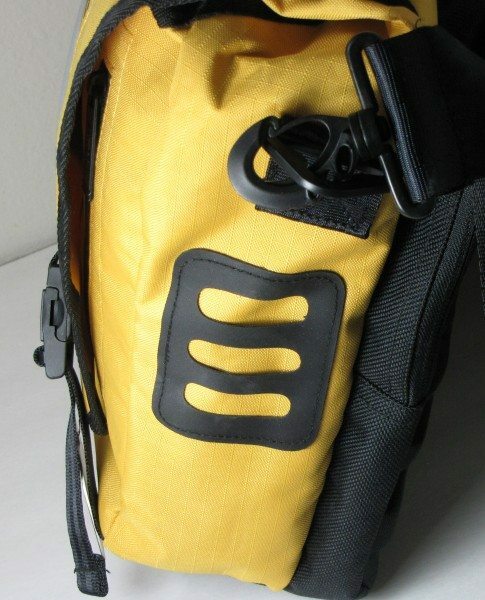 I have used my other Altego bag with Fidlock buckles extensively for my travels and have not had any issue yet. The buckles on the Lunar Messenger are the same as the ones on my other bag and I haven’t and do not expect to have any issues with them. The lower strap section of the buckle is adjustable to help give a secure closure to the front flap. The front of the messenger back under the flap has two zippered compartments that you can slip items such as phones, keys, even wallets into. The pockets do not connect so they are truly two separate pockets. The left side of the Lunar Mirror messenger bag has the attachment point for the included shoulder strap and a rubber like patch with holes cut out of it sewn onto the side. I am not sure what I would attach here but I guess it is nice to have if you need it. The right side is the same as the left except without the patch. 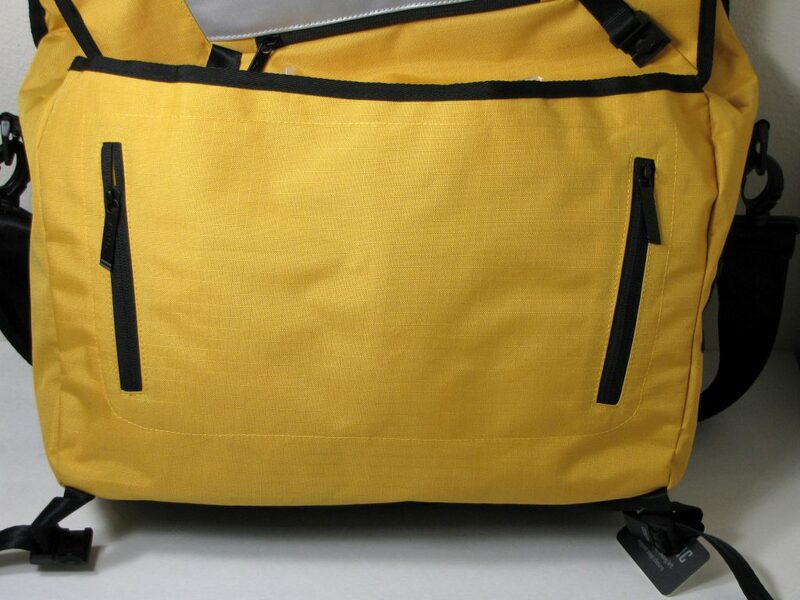 The bottom of the messenger bag has a different heavier material to add durability to it. 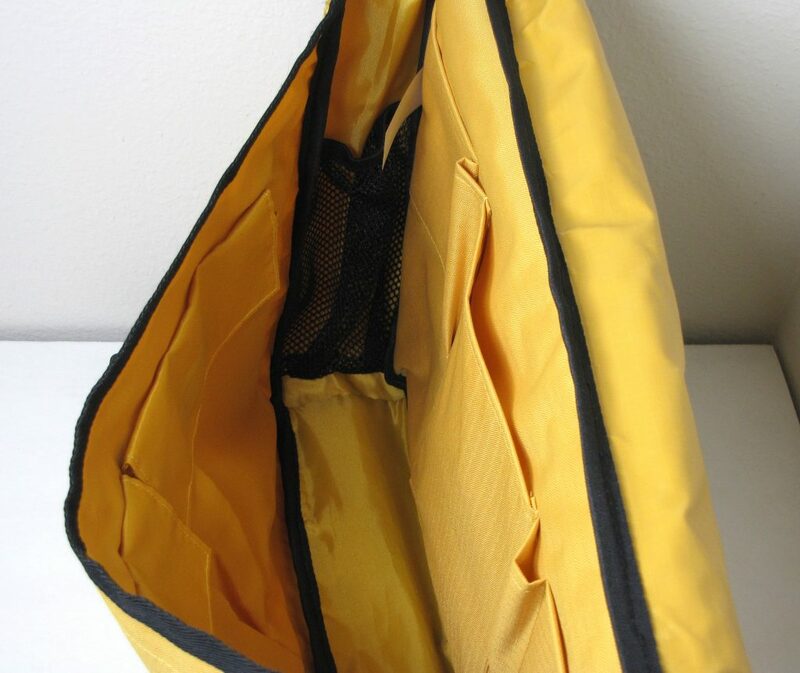 This should help with scuffs or abrasions from placing the bag on rough surfaces. The back of the Lunar mirror messenger bag is where you will notice its difference from most other messenger type bags. 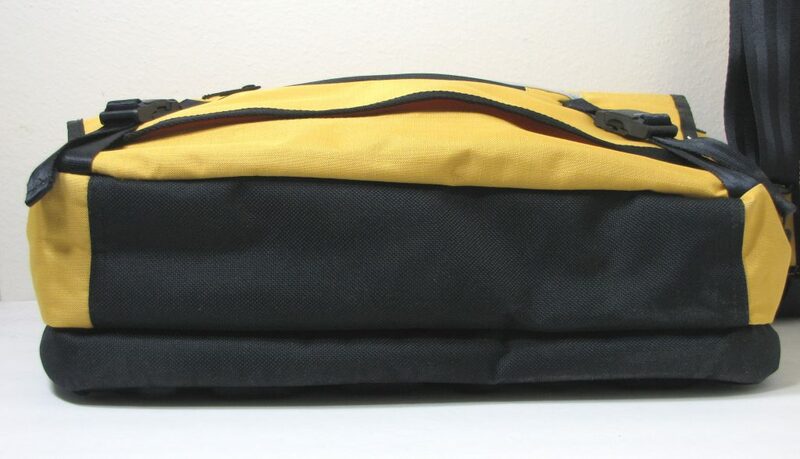 The back of this messenger bag has padding on the outside. 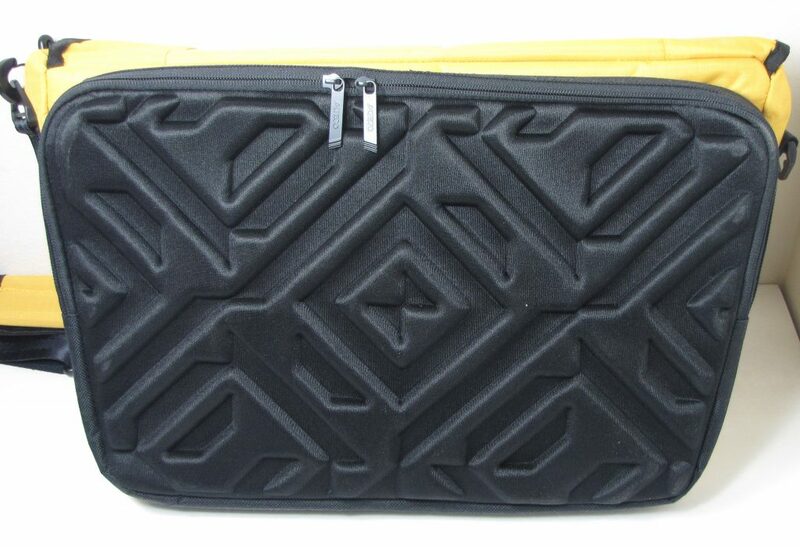 The padding not only helps protect you from bumps and bruises but it also helps protect your laptop and tablet. The back section is where Altego has designed a space to securely hold your laptop and or tablet device when carrying the messenger bag. 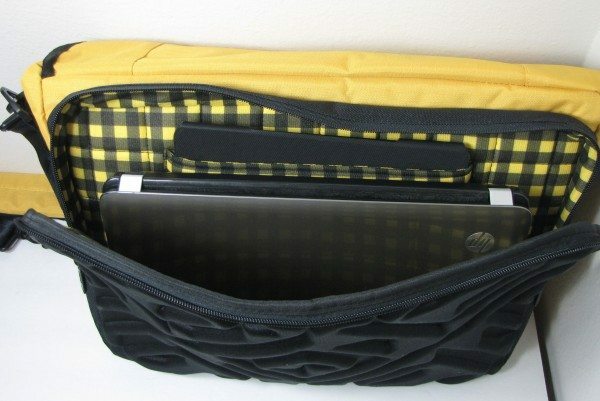 I believe the design is well thought out, having your laptop in the rear of the bag that is usually tucked next to your body offers some protection from both directions. 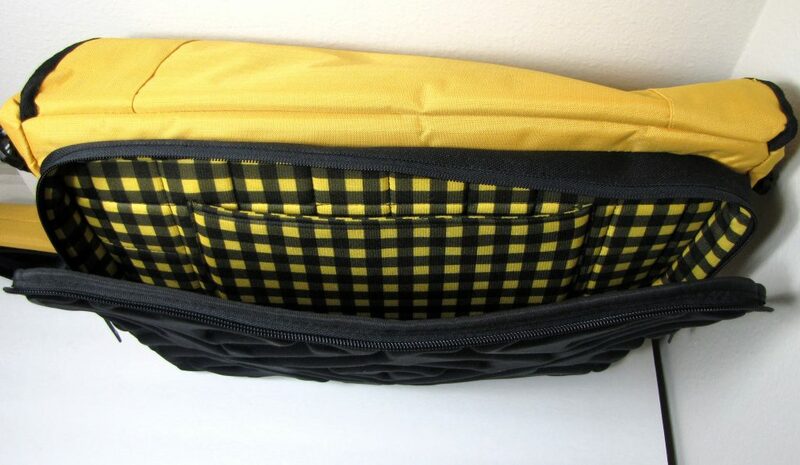 The padded laptop section of this messenger bag has a soft yellow and black checked padded flannel liner and a sewn in pocket big enough for some table devices. This section is opened using the two zippers that unzip almost halfway down the side of the back section allowing for good access to the laptop pocket. As you can see my 15″ laptop and iPad Air both fit securely in this back section of the messenger bag. The interior of this bag has ample room for all your stuff, with open pockets sewn into the rear of the bag, flap covered pockets in sewn into the front and a mesh pocket on the side. The Lunar Mirror will help keep you somewhat organized in what is usually an unorganized situation. One nice thing I noticed on this messenger bags was that the sides toward the back where the flap comes over, has Velcro to help keep them tucked in when the flap is closed. I did not understand why Altego did this at first, but then it dawned on me what happens when it rains? Most messenger bags when you close the flap, tend to let the sides flair out a little, especially when you have some bulky stuff in the bag. By placing the Velcro where it is, the side flaps tend to stay tucked in under the flap keeping your items dry. The Lunar Mirror Messenger bags shoulder strap is made out of seat belt webbing and comes with a nice detachable padded cover. I found the bag comfortable to carry with or with out the padded strap cover but for long hauls carrying my laptop I think I would want the strap pad on. 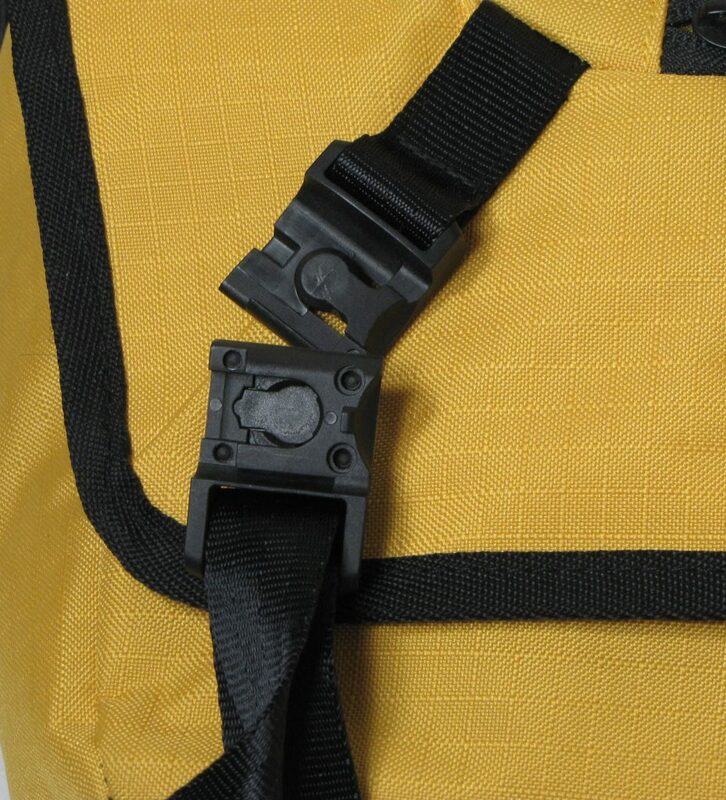 Although the attaching buckles seem sturdy, they are made of hard plastic and can be difficult to open. So, what’s my bottom line here? At this point in my life I am not sure I am the messenger bag type of person. That being said if I were going to convert to a full-time messenger bag user I would think, for me anyway, that the Altego Lunar Mirror Messenger bag would be the one I would want. 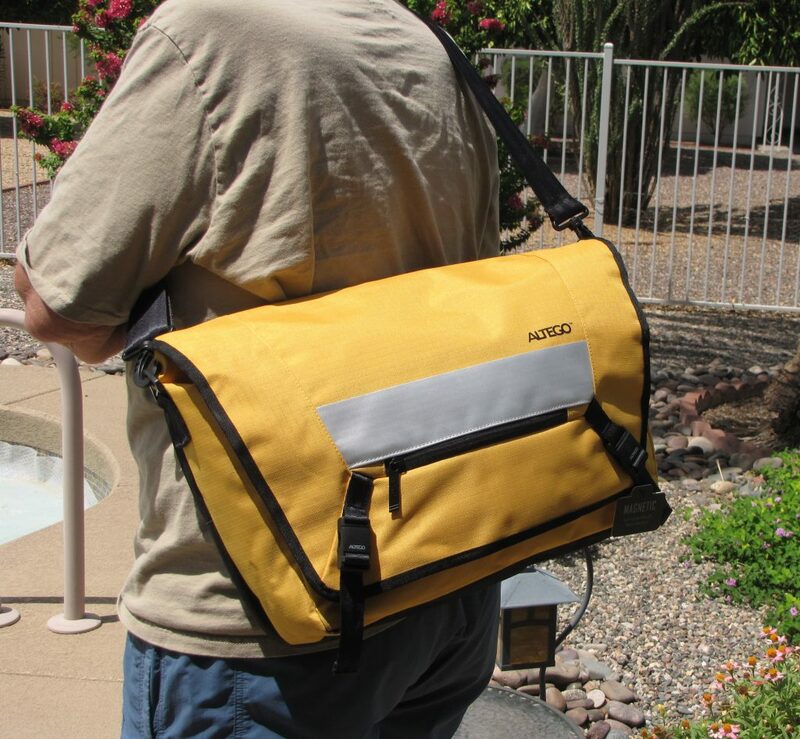 The bag quality is good, the size is good but two things really make this messenger bag stand out to me. The first is the laptop solution. I know messenger bags were not originally designed for carrying laptops and tablets, but we are a mobile society with a mobile lifestyle and mobile devices to match. The second is the attention to all the little details, the Velcro to keep the sides tucked in being the first that comes to mind. 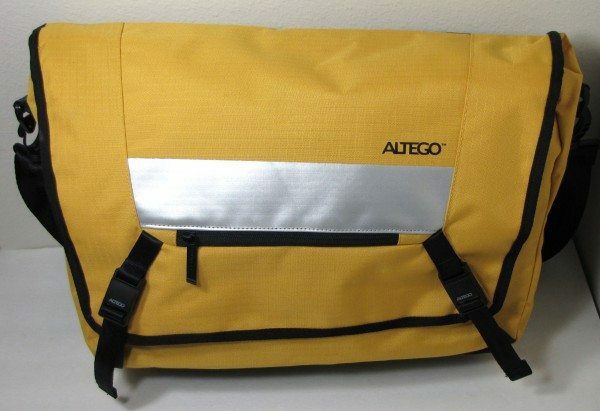 Altego has put a lot of little things into this bag that make it unique among other competitors in its field and at a price of $74.99 from the Altego store you would be hard pressed to find anything comparable. Source: The sample for this review as provided by Altego. Please visit their site for more info.